Gray whales migrating by the west coast now. HSUS gives Obama a B–talk about grade inflation. 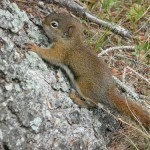 Scotland plans squirrel safari (this time not hunting grays) & more animal news.